All of our slabs are air dried and kiln dried down to below 10%. We take trees that would otherwise rot or be sent through a wood chipper, and turn them into custom furniture and cabinetry. People develop emotional attachments to trees. We respect this, and seek to continue the relationship with those trees even after they've been cut down. Instead of being destined for the mulch pile, the tree you climbed on as a child can become an heirloom table to pass down to your own children. Our philosophy has remained the same for 40 years; we recognize the hidden beauty in the unique grain of each piece of wood. Sam Willard built our mill using local trees his company cut down. It's still in use today, having survived upgrades and modernization. We mill trees into live-edge slabs, also called flitch. 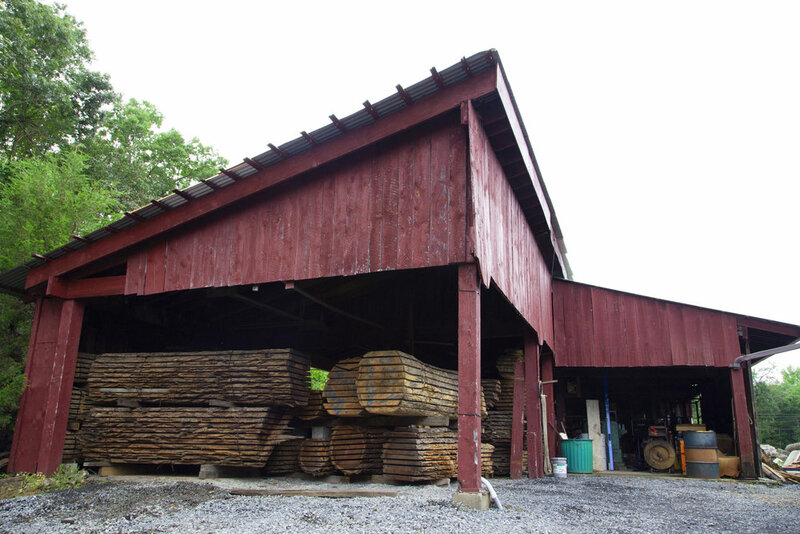 We also mill dimensional lumber, including many domestic and exotic species. Once the trees have been milled, they are air dried for 6 to 12 months, kiln dried for 1 month, and finally put on display in one of our barns. We have nearly a thousand unique slabs, and our knowledgeable and friendly staff can assist you with your selection, no matter what the project. You can also visit our online store, where you can purchase live-edge slabs, dimensional lumber, and burls.